1:57 aborting again -.75 and calling it a day and going camping. Thanks for coming. see you next week. 9/10/2004 1:30:53 PM Mountain wlj:: sunday is a bradley date. 9/10/2004 12:57:09 PM Mountain wlj:: early a.m. rally up to vert chrion/sat then the trap door opened. maybe a repeat ? so far we have the rally part. 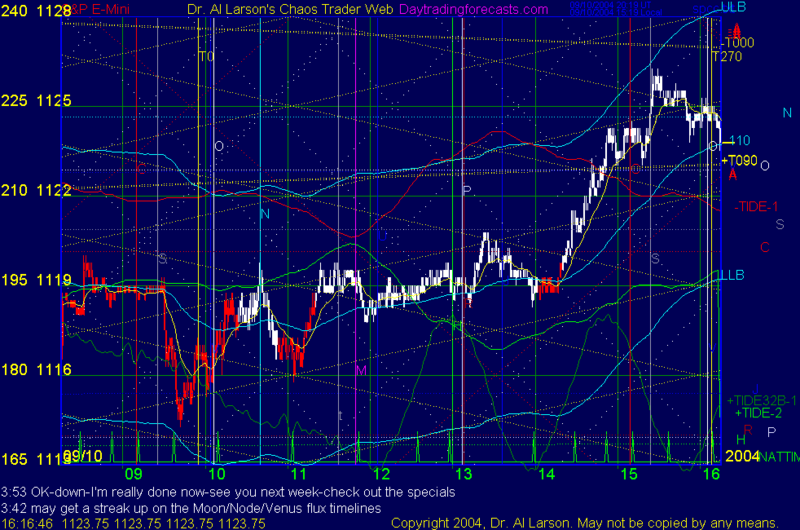 9/10/2004 12:46:52 PM Mountain wlj:: al called it, moon/node/venus time low up to 1123 moon/node/venus price. 9/10/2004 11:25:34 AM Mountain mjs:: HUMM is this one of those factrals? Is this the last leg? 9/10/2004 11:22:24 AM Mountain mjs:: OK EXMA is turning up and possible to draw a trend line up but the crossover was some time back. So this does not look like a trade yet. 9/10/2004 11:20:22 AM Mountain mjs:: broke out the course from mail last night. So below novice. Looks like EXMA is coming down. Per rules looks like wait for entry about 115 but if it is fast or that is expectation given it seems to have a top would this be a "good risk" to enter. 9/10/2004 10:39:32 AM Mountain wlj:: ascending triangle rally ? 9/10/2004 10:09:55 AM Mountain mjs:: the email suggested this would be a difficult day and recommended tight stops. Do you use "stand aside" days or just trade each day? and let the rules guide you. 9/10/2004 8:55:58 AM Mountain mjs:: just logged on, it looks very fast so far am I correct? 9/10/2004 8:22:16 AM Mountain wlj:: fwiw: the lowest price i have seen to trade electronic cotracts is in the $4.00 to $5.00 per contract range. go futures.com has the new low price.....99 cents a contract for all electronic markets..... full contract pit trades are $5.00 per contract.......day trade emini s-p margin is $500.00 per contract. merry xmas. 9/10/2004 8:04:16 AM Mountain wlj:: al' hot, nailed the first two swings. emini high before open bell just two tics off email chrion/sat price. then fell with in 1 tic of email mars/pluto price.